Grilling evolved from a type of cooking called Barbocoa, which seems to have been first used in the Caribbean. I started with a hole that was made in the ground. Leaves were thrown into the hole and lit on fire. The name of this type of cooking turned into the word barbecue in the United States, and the cooking method transformed from burning leaves in a hole incinerating pieces of wood in a manner similar to a campfire. 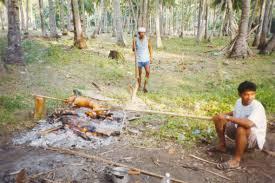 Campfires cook food in a way that is little different than methods used for everyday cooking before stoves were invented. Backpackers in places where burning firewood is permitted often go about preparing their meals in this way even today. They don’t have to carry stoves or bring fuel, and cleaning up afterwards is considerably easier. Grilling meals over a campfire brings about similar results to barbecuing with charcoal. In many situations charcoal barbecuing may be simpler. Barbecuing utilizes direct, radiant heat, and can cook meat and other food items quickly. Food cooked on a grill can be prepared in a grill pan using thermal radiation. Direct heat grilling normally exposes food to temperatures of more than 500 °F at which it can acquire a distinctive roast aroma and flavor due to the Maillard reaction process. This process creates hundreds of different flavor compounds which often break down to form even more new flavor compounds. Every different type of food creates its own distinctive set of these compounds. This is what gives almost any type of food a wonderful flavor when it is grilled or barbecued. Today, most family grilling is done with a charcoal or gas grill. E.G. Kingsford developed the charcoal briquette out of wood scraps that were being thrown away at Ford auto plants. The first charcoal was sold under the Ford brand name. 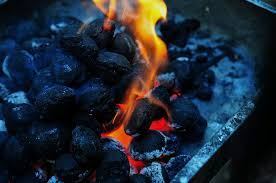 Grillers sometimes prefer using lump charcoal to using briquettes. Gas grills are usually fueled with propane or natural gas. Grills may have a direct flame or heat grilling elements which radiate heat. Regardless of the style of grill you use, there are likely only a few basic grilling accessories you need to create flavorful dishes on it. The important thing is to become experienced with your grill tools so that you can use them to quickly get the maximum nutrition, look, and taste from your outdoor cooking. 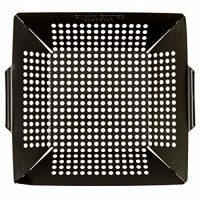 A non-stick grill basket is ideal for grilling vegetables, chicken, fish, steak, and pork. The size of the pieces is no longer a problem because the holes or slits let the heat, scent, and flavor in without your food contents falling into the flames. The coated surface makes it faster and easier to prepare the cuisine because it won’t stick to the pan. Stirring the contents while barbecuing and cleaning up afterwards are much less complicated. Simply IMMERSE Grill Pan IN SOAPY WATER THEN WIPE CLEAN after use so non-stick wok looks like new. The BEAUTIFUL APPEARANCE of these Grilling Baskets is RETAINED after many more grilling events. The SUPERIOR MANUFACTURING PROCEDURES make the best non stick vegetable basket for your BBQ tools. 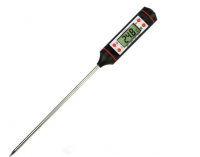 PTFE and PFOA FREE BBQ accessories ELIMINATE HEALTH CONCERNS for grill tools. These outdoor grill accessories are APPROVED by FDA and EUROPE FOR YOUR PROTECTION. 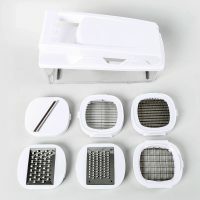 PREPARE YOUR FOOD IN A FRACTION OF THE TIME – Food chopper, with three different chopping grids, allows you to choose the size and shape of the vegetable pieces. – Insert cutting grid into the slicer cutter chopper and collect the slices automatically. ELIMINATE THE NEED FOR MANY OF YOUR KITCHEN TOOLS – Multipurpose food chopper has six optional grids for your choice as a mandolin slicer, potato slicer, fruit vegetable or cheese slicer, salad chopper, onion chopper, or vegetable cutter.